William Michael Weaver was born January 25, 1983 in Milledgeville, Ga., the second of three children, to Bill and Erin Weaver. He was 2½ years younger than Molly, and arrived 2 years and one month before Dan. He lived in an apartment, not far from where he would eventually live while attending college, and he and his brother and sister played on a swing set in a small backyard. Next door was a white dog, with black spots, that Mike enjoyed visiting. He attended preschool at Georgia College and enjoyed the college swimming pool. About a month before his fourth birthday the family moved to Macon, where they found a very large yard, lots of trees for climbing and friends in the neighborhood. He shared a room with Dan, and they became best of friends. For Christmas that year, he got a new puppy for Christmas, which was shared that year with Nana and Uncle Dan. They named the dog Doc, which was a name that Mike’s grandfather had earned as a high schooler way back when. Mike attended Rosa Taylor Elementary School, where he made many friends. He met Alec there, and they remained best of friends. Phillip was there, too, as was Anna, his first (of many) girlfriends. He got a bicycle, made friends with Lynn, who lived next door, and loved being outside. At the age of 5 he played his first baseball game at North Macon Park. He was a Yankee. It was the first of many years he would enjoy playing baseball, though he did not play as a 6-year-old. Seeking to play again at age 7, and finding all spots filled at North Macon, he went to Vine Ingle and began a long association with that good organization. Starting in T-ball, he advanced through coach pitch and minor league and major league and junior league and senior league and big league, and he umpired there as well. Also, when he was little, he played one year of recreation league football. He was a Raider. After elementary school, Mike went to Miller Middle School, where he met Adam and Sara Kate, among many others. He had started to grow, and was taller than many of his friends. He loved sports, as he continued to play baseball, and he also started fishing, a sport he continued to love, especially fly fishing. Mike was a promising student as well, showing great aptitude and ability to learn anything, and learn it quickly. He attended Central High School, where he played baseball and football. With his height, eventually 6-foot-2, he was suited for tight end; he started every game for three straight years. But baseball continued to be his favorite sport, and he did very well at it. His high school career ended rather tragically when he fell during a practice and cracked a bone in his left hand midway through his senior year. Through the years he dated many girls: Anna, Sara Kate, Kaitlin, Rachel and Lettie. They were all pretty, all very nice. Mike was never without a girlfriend for very long. After graduating from Central he went to Milledgeville and enrolled at Georgia College & State University. He and Adam had a wonderful first year in the dorm. They enjoyed life in their fraternity, Kappa Alpha, and made many good friends. They enjoyed being with Mike’s sister Molly and her roommate Leigh. They partied together and ate together and had many good times together. Mike developed a love of music, and enjoyed Widespread Panic, Dave Matthews, The Allman Brothers Band, Hootie and the Blowfish and attended the first and second Bonnaroo music festivals. After his first year in college, Adam and Mike moved into a house on Doles Boulevard with Josh and Michael, who had arrived in Milledgeville from his first year at Cochran. The four guys had a wonderful life there as college sophomores, with Josh being the “old” one in the house. Mike also had begun to play golf, and he and his dad had many good times on the golf course. Through the years the family had a tradition of renting a house at Pawley’s Island, S.C., for a week in the summer. The whole family loved that place. Mike and Dan would play in the creek, in a boat, in the ocean. They would hunt for crabs, fish, and enjoy each other’s company. In later years they all brought friends, and their friends loved the place, too. It was a special place, and still is, but one that Mike loved so very much. In the spring of 2003 Mike completed his resume as he searched for summer employment. In the summer of 2003, he had decided he wanted very much to get a job as a cook — he enjoyed cooking, and knew that Loco’s was opening a new restaurant in Milledgeville and had hopes of working there when he returned to Milledgeville. So, while he bided his time waiting on a cooking job to open, he worked with Alec out in the Piedmont Wildlife Area, disassembling an old church in a lumber reclamation effort for Alec’s dad. Just the two of them, in the middle of the woods, for many days. Mike came home filthy, but very much enjoyed the time with Alec, and the work, and the money. He was finally called to go to work at Loco’s, and began his training in July. With the opening of the Loco’s in Milledgeville, Mike became one of the cooks. He planned to work there part-time while he attended Georgia College & State University. At the end of his third week he got his first paycheck, cashed it, and was both happy and “wealthy” for the first time in a while. He and Michael traveled that weekend to Atlanta to see a concert; they were going to stay with some of Mike’s fraternity friends, good guys. After the concert that night, at the apartment, Mike was shot and killed when a friend of a fraternity brother got mad, pulled a shotgun and fired at Mike. He died August 16, 2003 on the way to a hospital. Jason Futch, the person who did the shooting, was convicted of murder and two other charges and now is in prison. More than 1,000 people attended the visitation at the funeral home. More than 750 people filled the church for the funeral, where they heard many wonderful tributes to Mike. Relatives from both families arrived from places near and far. It was so terribly sad. A guy with so many friends, so much promise, so much happiness, dead in the prime of his life. We saw two hawks fly overhead the day after his funeral, an old one and a young one — Mike and his grandfather. They squawked loudly as they flew overhead, signaling Mike’s goodbye. We miss him terribly. We loved him so much, and such a senseless way to die. 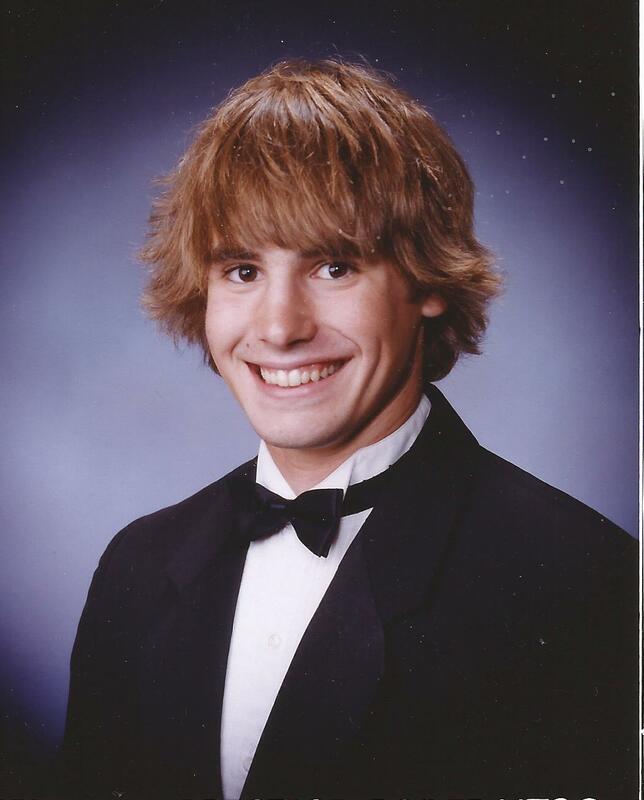 Mike was by far the sweetest, most handsome guy in school. He was so nice to everyone and I will always miss his smile. Such a sweet young man. What a legacy he leaves behind forever to be cherished by his family and friends. Awesome friends, and wonderful people. Take comfort in knowing you will see him again. We all loved Mike and when he came by Libertyville they were headed home after a cross country trip. They had been camping and having a great time on their own. How much I wish I had known Mike better. Big family reunions just didn’t happen because we were all so busy with work and such. Now we do get together and it helps. Adam & Mike, Joan and Mom and Dad – gone to heaven but not forgotten here on earth. I am a friend of Erin’s from Georgia College Cigna Building. I am thinking of both of you and keeping you in my prayers. Please tell Erin I said hello, and I am looking forward to her pulling the Georgia College crowd together. I commend you on the way you have chosen to honor your son. This is a great way to honor him. I met your kids when they were younger and you also.